The Kenyan government lacks a Countering Violence Extremism (CVE) policy aimed at finding a long term solution to violent extremism. Successful CVE approaches could include the communities that have been overlooked in conventional approaches—women, families and their communities. The state and media have played significant roles in fomenting cultural, political and religious divisions through systemic marginalization of and discrimination against Somali and Muslim communities. CVE programmes to combat extremist messaging could move away from negative counter-narratives and employ the same sophisticated social media tactics that extremists use. Rehabilitation programmes for returned fighters can be effective in countering extremist messaging. The emergence of the Countering Violent Extremism (CVE) agenda reflects a recognition in policy circles that conventional security-based measures to counter terrorism have failed and, in some cases, have fueled greater marginalization and violence. With an emphasis on prevention, the CVE approach seeks to tackle the root causes of extremist violence by engaging with communities, vulnerable groups and households. An increasing number of government and non-governmental organizations in East Africa are now working on CVE programmes, utilizing a variety of approaches to counter extremist narratives—through culture, religion, family support and economic incentives—with the aim of building collective security and community resilience to violent extremism. On 31 May 2016, the Rift Valley Forum in conjunction with the Australian High Commission hosted a forum on violent extremism and community resilience. During the event, Michele Michele Grossman from Victoria University reflected on the lessons learnt from Australia’s approach to CVE. Countering violent extremism has become a widely used term to describe a range of soft-power approaches to fighting terrorism, according to Michele Grossman’s report ‘Preventing violent extremism: smarter approaches, lessons learned’. Governments around the world commonly deploy hard-power tactics, such as military force, economic and security sanctions, or legal and physical coercion to deal with terrorism. While these tactics may have immediate success, they fail to establish strategic long term and sustainable solutions, and often exacerbate the problem by contributing to the radicalization of individuals who join violent extremist groups. Foreign interventions in Somalia to combat al-Shabaab, including Kenya’s, have mostly employed conventional hard-power approaches that have disrupted the group but failed to tackle the problem of violent extremism. Moreover, the marginalization of and discrimination against Muslim and Somali populations in Kenya and the role the media has played in this has worsened the situation. Rashid Abdi from International Crisis Group noted that Kenya has struggled for the last two years to develop a CVE policy. In order to combat violent extremism, Kenya needs to capitalize on hard-power tactical successes by implementing a comprehensive CVE approach that addresses the underlying reasons behind the problems. These CVE strategies should employ socially-focused tactics that include the rehabilitation of returned fighters, constructing effective counter-narratives, developing community resilience and, especially, harnessing the power and influence of women and families in communities in combatting extremist ideologies. The role of women, families and communities in countering extreme violence is often overlooked. Instead, the focus is usually placed on young men. Efforts to find solutions usually involve experts, policy makers and community leaders. Many of these stakeholders are either disconnected from the communities involved or lack in-depth relationships with the community, as in the case of local politicians, religious leaders and elders. Michele Grossman noted that women play key roles in fostering community resilience and in influencing world-views and attitudes among young people. Women and other family members are advantageously placed to identify behaviours and attitudes that might indicate that individuals are becoming radicalized. Mothers especially are fundamental in influencing young people and, therefore, the way they respond to extremist narratives. Mama Lul Issack, who works primarily with women living with HIV/AIDs in the Muslim Somali community in Eastleigh, pointed out how CVE has been applied mostly by people from outside the Somali community, yet people still associate violent extremism as something that originates from inside the community. She stated that terrorism, and the stereotypes connecting Muslims and Somalis to terrorism, are ‘a monster we do not welcome.’ She pointed out that the full participation of the community—especially in combatting violent extremism—is hindered by religious and cultural norms. The confluence of Islamic and African values in the Somali community maintain a women’s place in society within the private sphere of her home. Therefore, women feel it’s not their place in society to engage publicly on these issues. However, it is women that suffer the most as these same religious and cultural norms contribute to men having multiple wives and families that they cannot fully support. These norms therefore affect boys’ and young men’s propensity towards extremist ideology as they become idle and end up engaging in crime and drugs. Mama Lul described how young boys are recruited into small gangs and get caught by the police. Mothers are often the ones who pay the police the bribe to have them released. The lack of a strong and responsible father figure consequently feeds into the process of radicalization and recruitment towards violent extremism. Excluding women and mothers in helping to solve the issue worsens this predicament. Mohamed Shale Billow from the Life and Peace Institute spoke of the organization’s experience in Kamukunji, Nairobi, where their research revealed that men are very afraid of the state apparatus—especially security forces—and are therefore not ready to talk about extremism, terrorism or CVE. While men were shy, women, on the other hand, were very open—perhaps because they are not directly threatened by the state or were not seen as threats by the state. Mohammed Shale Billow pointed out that there are many reasons why people choose to join a radical movement. In Somalia especially, the lack of a central state leads to community conflicts in which weaker communities will either seek help from extremist groups to redress a power balance, or an extremist group might take advantage of clan divisions. Policies and interventions that foreign governments use—such as military force—within Somalia, often label and consequently alienate whole communities which then become susceptible to extremist groups’ support. In particular, the foreign invasion into Somalia by neighbouring countries such as Kenya and Ethiopia, have helped al-Shabaab flourish. Extremist groups will often appeal to patriotic sentiments using the country’s predicament of being under attack as a rallying call for citizens to take up arms to fight for their nation. While many Somalis might not buy into the extremist ideology, they might subscribe to the nationalistic rallying call that extremists use. The media has also contributed significantly to producing inaccurate and sensationalized reporting on Islam and the Somali community’s perceived links to terrorism, undermining social cohesion between different cultural and religious groups. An audience member stated that policy actors need to look at media framing, influence and freedom in its totality. There is a need for cooperation with the media because of the burden placed on the media to frame the message. One way extremist groups and their recruiters take advantage of marginalized groups, especially young and alienated individuals, is through sophisticated extremist narratives, which make advanced and evolving use of social media platforms. Recruiters’ narratives tend to be positive, with messaging built around a framework of providing an outlet for frustrations or a romanticized and idealistic life for disenfranchised youth. Existing counter-narrative methods have not been effective in contesting the messaging used by recruiters. Currently, most counter-narrative frameworks tend to be against something, with negative messaging focusing on the obvious, i.e. how evil al-Shabaab and terrorism is. 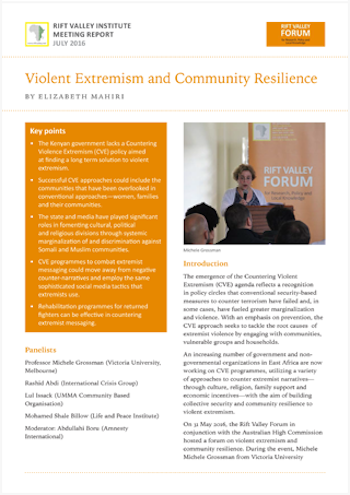 Michele Grossman concluded that there is counter-narrative fatigue combined by an increasing distrust of the Kenyan government’s efforts in forming mutual partnerships to challenge violent extremism. Most panelists agreed that counter-narratives need to move away from negative messaging and invest in more positive and affirmative messaging. Counter-narrative strategies also need to use social media and other advanced communication tactics that extremists use. Additionally, there is a need to enhance young people’s ability to critically understand and question interpretations of religion, history and politics, and a need to open up dialogue and spaces where young people can develop these critical skills. Most importantly, effective counter-narratives need to originate from at-risk communities and should focus on offering realistic alternatives to extremist ideologies. These narratives should acknowledge the need for forms of activism and solutions that promote real change through non-violent means, as well as narratives that promote inclusion. Well Told Story (WTS) is an organization in Kenya that is making progress towards crafting effective research-based counter-narratives, and recounting fictional stories based on real-life experiences of youth in at-risk communities in both Mombasa and Nairobi. The organization produces print, radio and TV outputs aimed at triggering behavioural change away from youth radicalization and extreme violence. Research by WTS on the key drivers of youth radicalization confirmed that young people’s alienation and abandonment by both the state and the community leads them to resort to radical measures to survive. According to Evelynne Kemunto from WTS, youth find acceptance and meaning in extremist ideologies and groups who recognize their problems and give them a purpose. An audience member asked how one can identify true narratives. Michele Grossman proposed that one way is to legitimize grievances that are true, because grievances are key drivers in radicalization. When states and communities acknowledge and legitimize grievances, this constitutes a counter-narrative as it contradicts extremist recruiters who insist that the community and state do not care about these grievances. Mama Lul noted that women representatives and politicians are engaged in CVE initiatives in the communities they represent, although their voices are often drowned out. It is estimated that there are 1,500 al-Shabaab fighters in Kenya who have returned from Somalia. According to Rashid Abdi, many have come back disillusioned and in need of rehabilitation. Currently, there is no coherent rehabilitation programme for those who have come back seeking reintegration into society. Kenya’s coast, specifically Kwale County, is now home to a growing number of these returnees. The state treats them as al-Shabaab sleeper cells, while al-Shabaab sees them as deserters. This has resulted in numerous disappearances and killings in Kwale. The lack of rehabilitation programmes is extremely dangerous as it creates a ‘double-whammy’, said Rashid, as returnees might end up going back to Somalia even more bitter and angry than before. One of the key benefits to rehabilitating returnees is their ability to influence those considering joining radical violent movements, as they offer more authentic and believable counter-narratives than those that are manufactured. Furthermore, the process of rehabilitation would be an active counter-narrative from the state. Michele Grossman noted that there is more evidence showing experiential, rather than structural, commonalities among youth that end up being radicalized and recruited. She concluded that these experiential factors include feelings of humiliation, a lack of dignity and a lack of respect. She argued that marginalization, discrimination, income inequality and structural disadvantages produce not just a narrative of humiliation, but also the experiential underpinnings that provide the link to radicalization.